With a day off work and a few hours spare I decided to visit Dartford marshes and the Thames foreshore in the hope of a Caspian Gull as a few had been seen recently by Andy. It seemed strange venturing out to a familiar site that I spent nearly 20 years watching on an almost daily basis often before, during and after work! 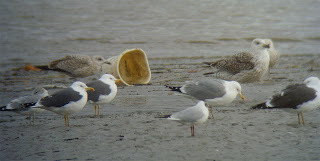 In the olden days we could find Yellow leg Gulls amongst the Gulls on the foreshore as well as the nearby Dartford tips that provided hours of entertainment pre Larid mania. Little did we know that another species was in the making, the 'Pontic Gull' that transformed into the beautiful phenomena we now call Caspian Gull. Access to the marshes is sadly no longer as straightforward as it once was, and back in the 80's we used to drive to within a few metres of the Thames and only had to brave the weather for a short while if it was too cold before retreating to the car. One year I remember parking up by the barrier on the concrete platform watching Guillemots on the river, another time a Pom Skua and all the time looking across to Rainham in Essex envious of what they were seeing with less disturbance and a much wider expanse of habitat home to many a good rarity over the years such as Solitary and Western Sand, Lesser Kestrel, Black winged Stilt, Red footed Falcons and even a Bluethroat one year!! 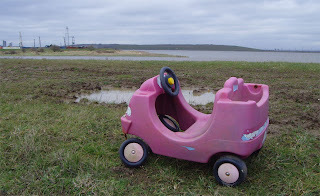 I had this time to park near to the burnt out cars and burger van and walk to the foreshore enjoying pretty much the same habitat I remember from before except the larger piles of fly tipped rubbish and heavily frost damaged road. Once at the Thames I saw a Common Sand, these used to be a regular wintering bird and sure enough a few Gulls on the foreshore with a Yellow leg Gull, but no Caspers. 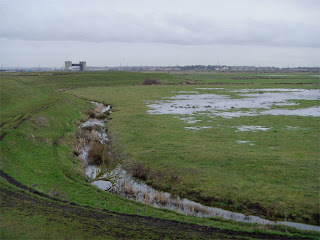 The flooded fields that if present in the spring could hold a wader or two but I doubt it, they'll all be at Rainham ! 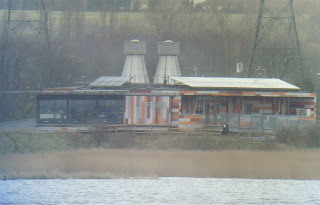 The wonderful eye catching RSPB centre at Rainham Essex viewable across the river blending in with it's natural surroundings, the toilets working hard to naturally break down many a birders mars bar and pork pie! A comfy place to view the Thames from whilst having a hot drink and a slice of cake whilst on the Dartford side!! A thoughtfully placed portable hide that allows one to get close to the Gulls and obtain some cracking photos. The Gulls are totally oblivious to this fensman type hide that one can crouch behind and not attract the attention of passers by whilst having a cold can of coke and a packet of crisps. 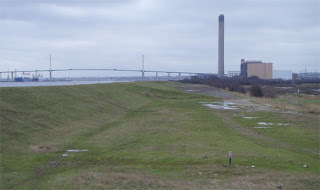 Why o why didn't Dartford see the foresight to have something as good as Rainham has, no chance...........................concrete it all over provide jobs and let the locals have a gun club, motorcycle track, and somewhere to tip rubbish! Gulls as viewed from the hide at Dartford!! It was a treat to be back there again I forgot just how good birding there was, who needs Rainham and it's multitude of birds anyway!